Not all Halloween-related stuff has to be horror-filled and morbid. That's the case with the next game I'm covering. Although it is packed to the brim with ghosts, there's nothing scary about this game. Perhaps the shocking quality of it? Anyhow, there's only been a handful of reviews for this game, but I've added my own verdict to the small pile. It's Pac-Man and the Ghostly Adventures 2. Note: The Wii U version was the one covered, hence my own screenshots. Pac-Man fans seem to cherish the Pac-Man World series that mostly appeared in the PlayStation 2, GameCube, and Xbox generation of home consoles. Perhaps it's nostalgia of playing those games when these folks were younger, as someone new to the games like myself played them for the first time recently and didn't find them satisfying at all. They had cameras that worked as well as Ms. Pac-Man's recent solo career, a complete lack of polish, and frustrating game mechanics. 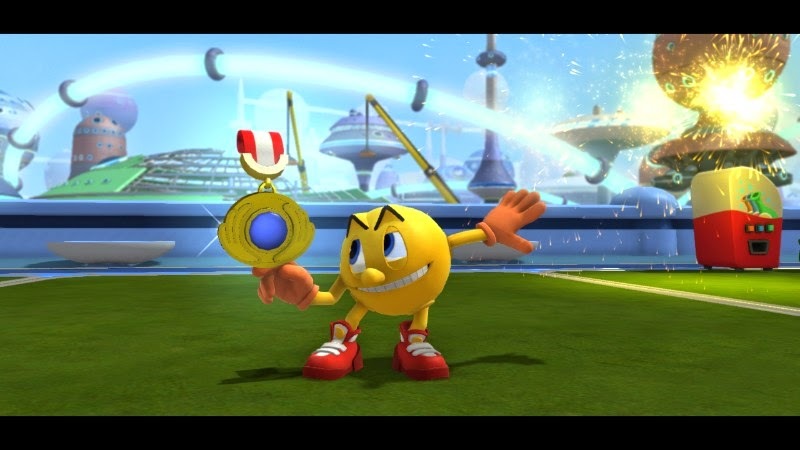 When I originally looked at the first Pac-Man and the Ghostly Adventures, I thought it would merely be an adequate licensed game at most, but I found myself enjoying the game and believed it to have some genuinely smart ideas, although not executed to a high caliber. Less than a year later, here comes the sequel, and one would think that for a game with such short time to brew would be a catastrophe. 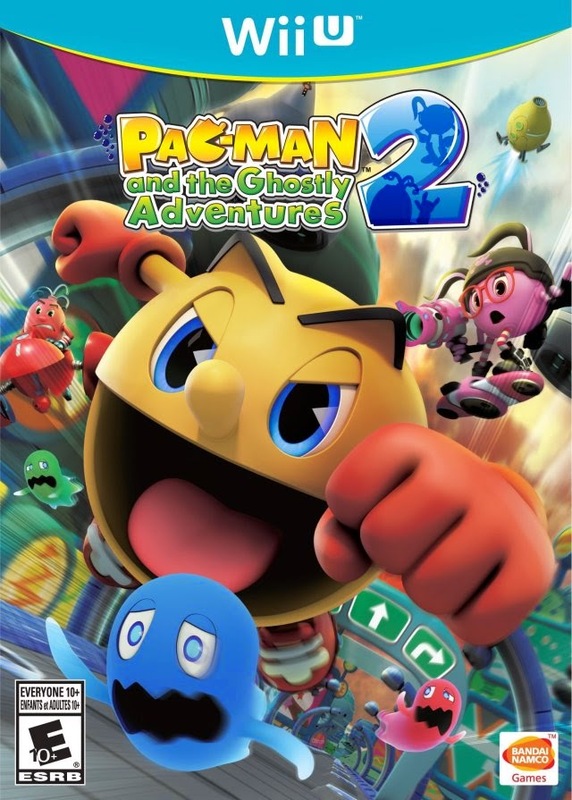 Not only is it not that, but Pac-Man and the Ghostly Adventures 2 is actually an incredibly competent 3D platformer with clever level design, smartly hidden secrets, and in all a largely better game than its predecessor. Using the same cast of characters as the licensed cartoon of the same name (well, only without the number two in the title), Pac-Man and the Ghostly Adventures 2's tale is humorous and charming enough. The evil Betrayus from the Netherworld once again wishes to obtain the fabled repository, the canister that has every evil ghost sealed inside it, including Betrayus' physical form. He devises a plan to have an unassuming Pac-Man lead him to his treasured prize. 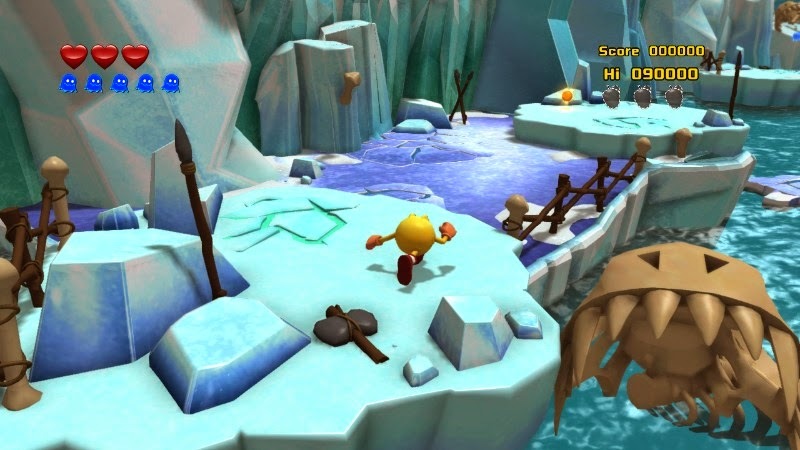 Thus, what follows is five worlds of about ten levels each of 3D platforming action. The start of the game is innocent enough. Upon the first two levels of Pac-Man and the Ghostly Adventures 2, I had a very been-there, done-that feeling. I ran through city streets, up on the rooftops of buildings, and leaped from vanishing platform to vanishing platform. However, quickly I found myself being genuinely surprised by the quality of the majority of levels after. Not only did each have its own new mechanic or type of obstacle to contend with, but the levels were actually memorable to a degree. Okay, things are getting a little interesting now. One level had me using Granite Pac, a Pac-Man transformation that turns our hero into a stone ball, and rolling around inside a gigantic makeshift pinball arena. I can't forget about other transformations that led to some creative platforming. There's a transformation that turns Pac into a bouncing ball, allowing him to wall jump with ease. There's Chameleon Pac, allowing him to latch onto poles to swing from-- no matter how unsanitary that may be. 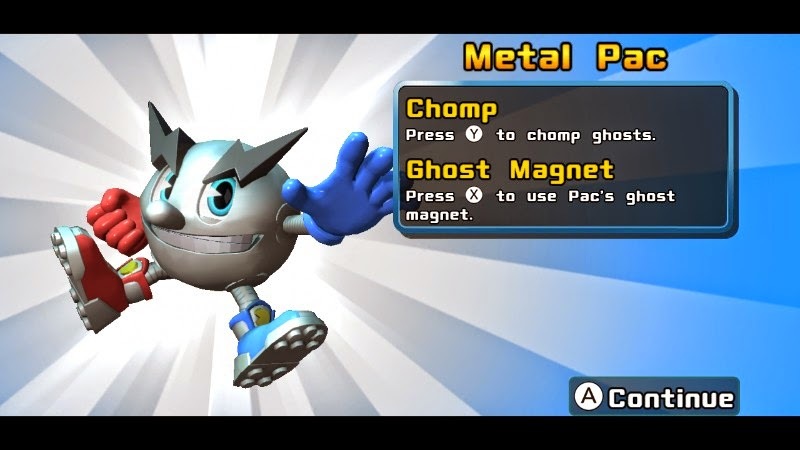 There's also fire and ice transformations, the former allowing Pac to glide large distances, while the other grants Pac with the ability to freeze enemies and fountains of water and lava. to these solid metal surfaces. Others were less original, borrowing heavily from Super Mario 3D Land and games of its ilk. For one, there were platforms that flipped each time I jumped as Pac-Man, while another had platforms that would vanish and then appear at intermittent timed intervals. somebody, why not borrow from the best? 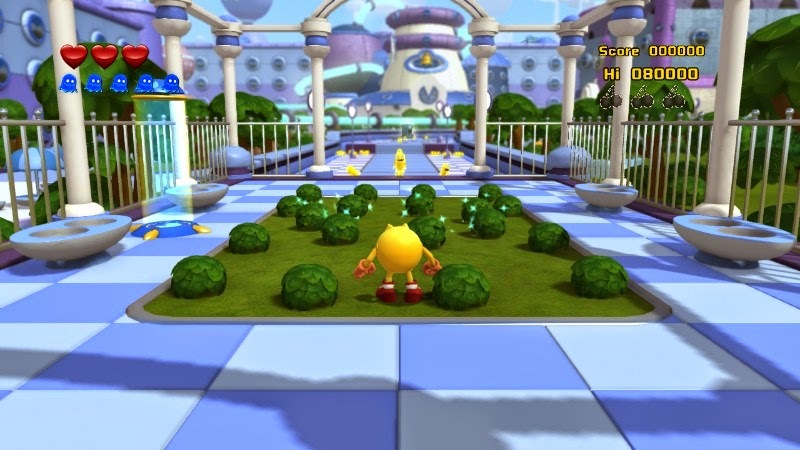 The problem with the original Pac-Man and the Ghostly Adventures was that the game relied on haphazard level design. There were too many platforms floating in midair for no reason whatsoever. With this sequel, the levels are more natural in design. They lend well to the environments and scenery and don't feel out of place for the most part. It's time to get wheel. Er, real. And, boy, are the environments impressive! 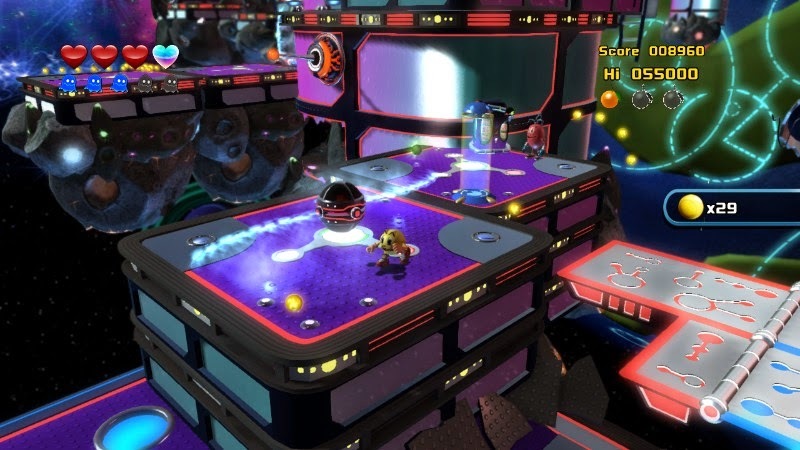 Ghostly Adventures 2 boasts a wide array and variety of level types and locales. 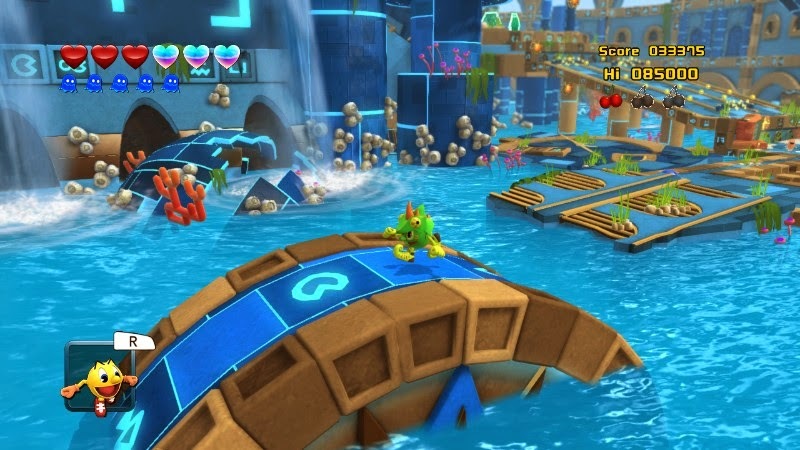 From an underwater paradise in the form of Paclantis to going back into the prehistoric past and even into the depths of space, Pac-Man and the Ghostly Adventures 2 sports plenty of environments to keep the game fresh from beginning to end. In space, no one can hear you gobble up ghosts. Another thing to keep the game fresh are new level types in general. 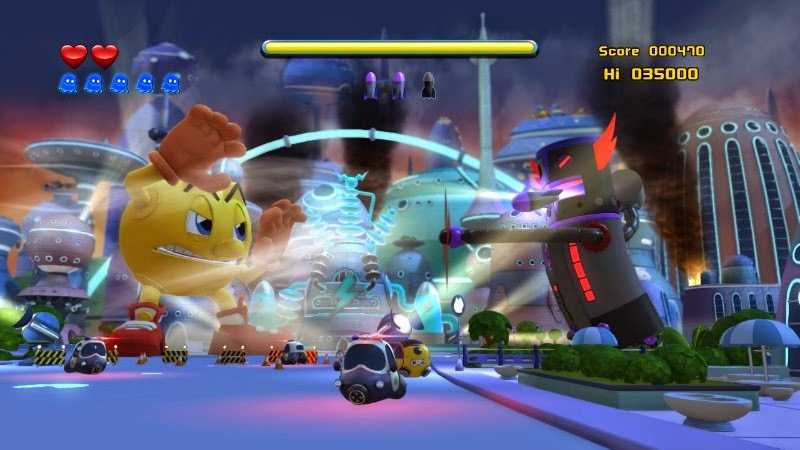 Some levels with have Pac-Man or one of his two closest friends piloting a vehicle of some type. These levels are on-rails experience, with the ones taking place in the air feeling like something akin to Star Fox. These levels are nice to have, they only happen occasionally, but when they do, they add some diversity to the game. Furthermore, fighting an invisible enemy in the form of a camera is no issue this time around. The Ghostly Adventures 2 does not have manual camera control, meaning you need not worry about fiddling around with the right analog stick to get the desired angle. This would be a problem if the game's fixed camera didn't properly follow the action or give you bad angles to work with. Thankfully, this isn't the case. 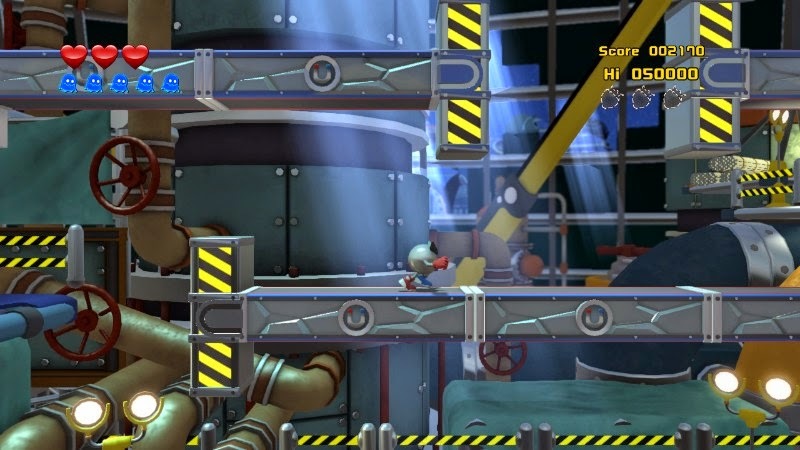 What this does is allow for a more streamlined platforming experience. 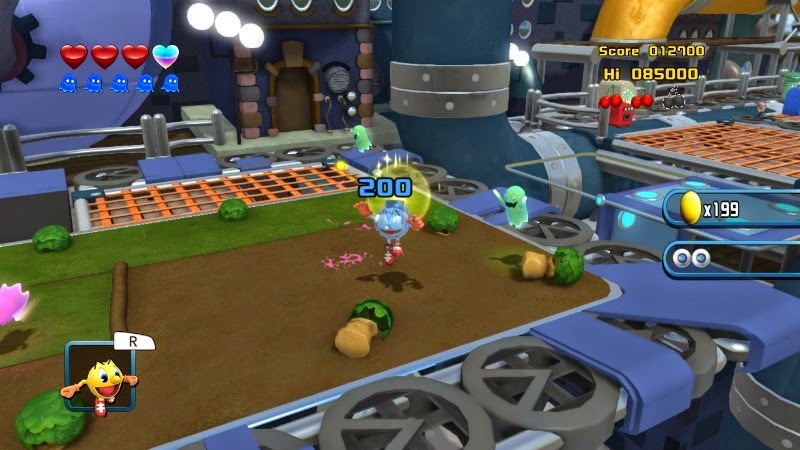 The original Ghostly Adventures did not have much reason for players to return to levels other than having them replay a level without any changes just to earn an arcade token. It was filler in every sense of the word. In Ghostly Adventures 2, each level has a high score to attain. It's not just about gobbling every ghost in sight, but doing so with a bit of strategy. Pac-Man has something the game refers to as a Boo! attack. When enough ghosts have been consumed, this Boo! attack is ready to be utilized. When used, it turns every ghost in the nearby vicinity into a frightened, crazed creature, roaming around in a hurry with the fear of being eaten. It's in this form that ghosts are worth the most points, and creating a chain of gobbling ghosts can rack up points mighty easily. Using the Boo! attack at just the right times in levels can make the difference between coming close to a gold medal and being stuck with a silver or worse. It's a full-on Pac attack! However, gobbling ghosts isn't the only means of attaining a high score. In each level are three special items, usually fruit, that are the collectibles within Ghostly Adventure 2. Some are out in the open, some are hidden, while others are in secret portals that take you to a 2D platforming trial. Finding some of these collectibles made me have to play through some levels up to three times just to find all three of these collectibles in a level. Doing so isn't just for my O.C.D. completionist's sake, but having all three fruit or whatnot at the conclusion of a level doubles your final score, making getting those high scores all the more possible. I'm a bit of a platforming expert. It's my favorite genre of game, and I'm well versed in it. Pac-Man and the Ghostly Adventures 2 scratches an itch for that 3D platformer I've been wanting. Memories of Super Mario 3D World weren't cutting it anymore. Regardless, with that said, the game is a bit on the easy side. The developers waste no time raining down extra lives on you, handing them out like candy on Halloween night. (See how I made this review topical all of a sudden?) By the first world's end, I was near 60 lives, and for the majority of the game I hovered around the maximum amount achievable. In the prehistoric levels, the Pac-Man cometh. The easiness of the game doesn't end there, either. There is a copious amount of food that restores health, and there are plenty of silver orbs that add temporary extra hearts. One would think Betrayus would dismantle all of the vending machines within his hideout, but Pac-Man foes were never the smartest ghosts of the haunted bunch. Considering that falling off a level only costs you a heart instead of a life, and that losing a life sends you back to one of the myriad checkpoints in a level, Pac-Man and the Ghostly Adventures is decidedly a less challenging game than most would like. For me, there were enough platforming challenges and enemy hordes to take down that I was satisfying, heck, I even loved the experience. 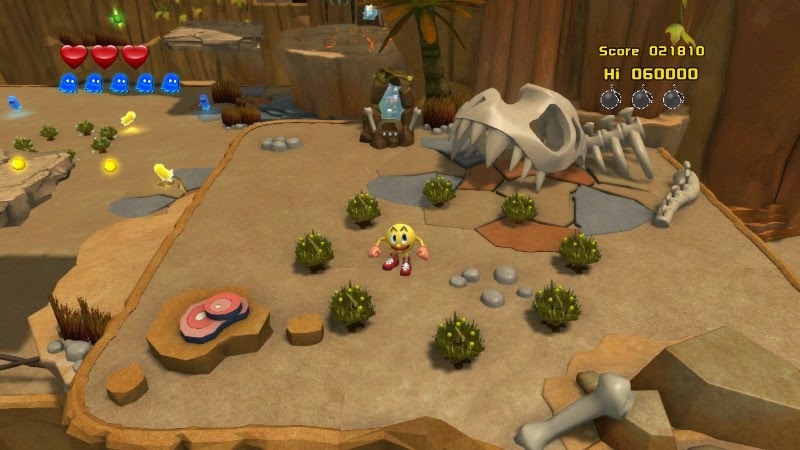 Pac-Man's second Wii U outing is quite good. Pac-Man's latest presents some nice visuals from beginning to end. They're by no means something jaw-dropping, but there were times when I sat back and admired the view. The loading times, at least on the Wii U version, are just long enough to read the gameplay hints shown during the loading screens. Not that bad at all. The audio also impresses at a multitude of spots, featuring some catchy themes, some orchestrated, some not. The voice work in the game is quite endearing, albeit very cheesy. Nonetheless, it's perfect for the target market. Paczilla! Someone phone Tokyo! Is Tokyo okay?! 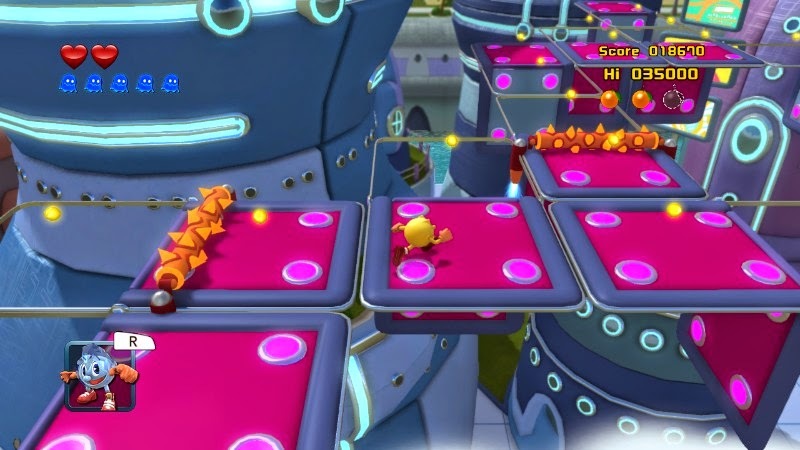 Going into Pac-Man and the Ghostly Adventures 2, I did not expect much coming from a sequel with less than a year's development time. However, the game managed to impress me multiple times with its tight platforming, above average combat, clever level design and secrets, and presentation. 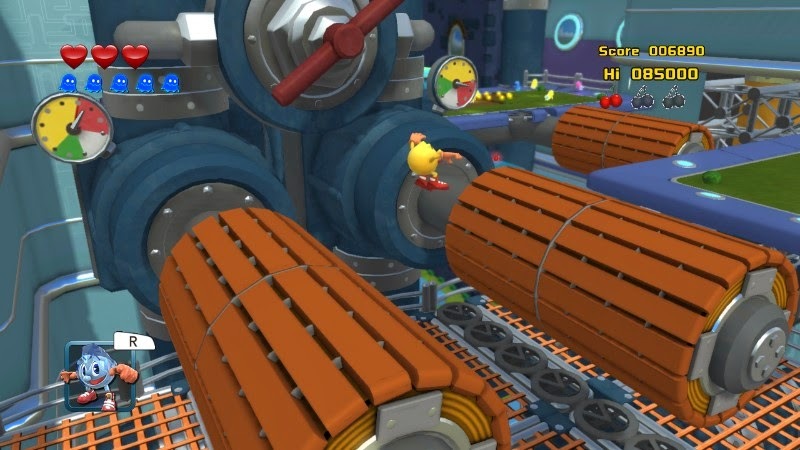 If you were one of the folks who have fond memories of the Pac-Man World games (which in my mind is only from nostalgia, as the games aren't very good), then you owe it to try out Pac-Man and the Ghostly Adventures 2. Like me, you need not even be a fan of the subject material, the cutesy TV show. All you need is a thirst for a genuinely good, but not great, 3D platformer.